Road Trip is one of Saucify’s creations. 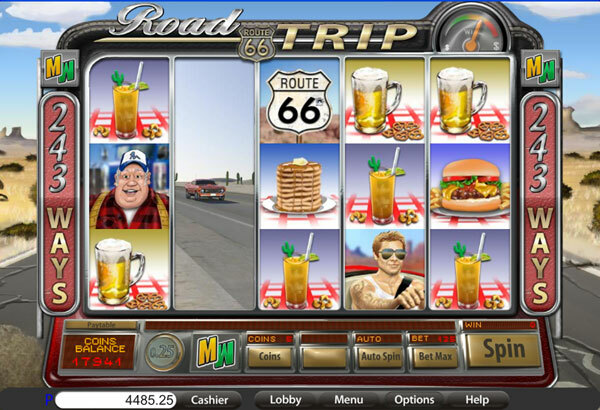 This slot machine uses Route 66 as inspiration, with long road trips being at the center of its attention. 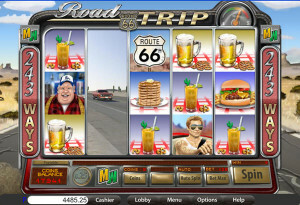 The game has various characters that are on the road or simply working in some diner along Route 66. There are trucks and muscle cars, hamburgers and stacks of pancakes. This kind of theme has been part of the slot machine industry plenty of times before, but it doesn’t hurt to have one more. One of the few slots from Saucify to use the ways to win system, it has 243 of these so called paylines, along with wild symbols which expand, with scatters, free spins and multipliers. You can win prizes which only go up to $625. The features of the game consist of ways to win, expanding wilds and two scatters, one of which also brings you the free spins. The ways to win are simple enough to use and understand. You have a game here which uses symbols that are on neighboring reels to form a combo, without the requirement to have them on fixed positions on certain paylines. The result is the 243 ways to win that are offered here. When it comes to special symbols, first of all we have the muscle car, the Ford Mustang. This is an expanding wild which has its place on the 2nd and the 4th reels of the game. Appearing there, the wild expands and covers the entire reel, able to substitute for any symbol in the game if this will get you a new combo. The wild is even more useful since the slot uses ways to win. Scatter symbols are of two types. The kind that will only pay prizes is the one with the Route 66 logo on it. Having three to five such symbols present will bring you prizes which vary between 3x and 75x the total bet. The Dude, tattooed, wearing sunglasses and driving a car, will be the one you see in the symbol which acts as a scatter and is able to get the free spins going. Between 10 and 20 free spins are given to players that land 3 to 5 such symbols. The thing is, these scatters need to appear on adjacent reels, which takes away from some of their power. You win doubled prizes while these free spins are in use and you can retrigger them as well if you get lucky. Whatever line bets you want to use in this game, the total number of lines that are selected for the purpose of betting will be 25 at all times. The 25 lines are sufficient for you to cover all the ways to win of the slot. You can bet between $0.25 and $31.25 each round. The line bets use 1 to 5 coins, with values of up to $0.25, so a maximum of $1.25 per line. The game gives away payouts of up to 500x, which might seem low but it’s in a slot with ways to win, so it’s far from being as bad as it might sound. The cash amount goes up to $625, for 2,500 coins. Dedicated to Route 66 and to road trips in general, the game shows you the open road behind the reels, with a prairie like environment all around. The symbols are busy showing you images of things you get to enjoy on the road, and it’s mostly about the foods that diners offer you. There are a few characters as well, like the car driver, the truck driver or the diner’s waitress. Symbols: Ford Mustang (wild), Driver (scatter), Route 66 Sign (scatter, 75x the bet), Semi Truck (500x), Waitress (300x), Truck Driver (150x), Burger (80x), Pancakes (60x), Ice Cream Sundae (40x), Beer Mug (25x), Ice Tea (15x) and Coffee with Donuts (15x). Since the game offers ways to win, the prizes are not as bad as they might appear at first, and the game does have the kind of theme that will make you dream about road trips and meeting new people. I’d say it’s up to you ultimately, as the game is not a must play title. This Road Trip Max Ways slot is offered by all online casinos with Saucify/BetOnSoft software, playable either in practice or in real money mode.